G and I are currently at a luxury spa celebrating my 30th (sorry to make you jealous! ), so I have scheduled today’s post for a fantastic DIY to make a traditional Christmas wreath. 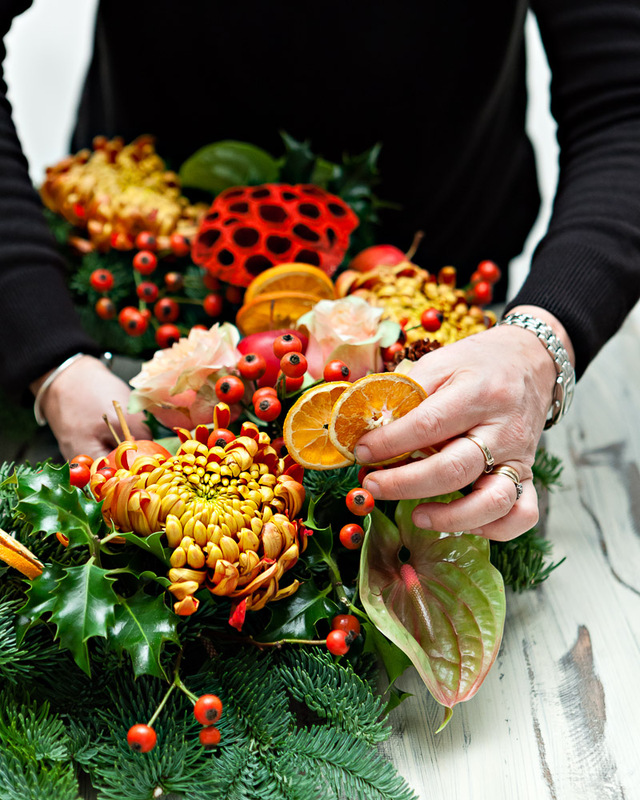 I hope this tutorial from Interflora gives you some Christmas inspiration for making your own wreath. 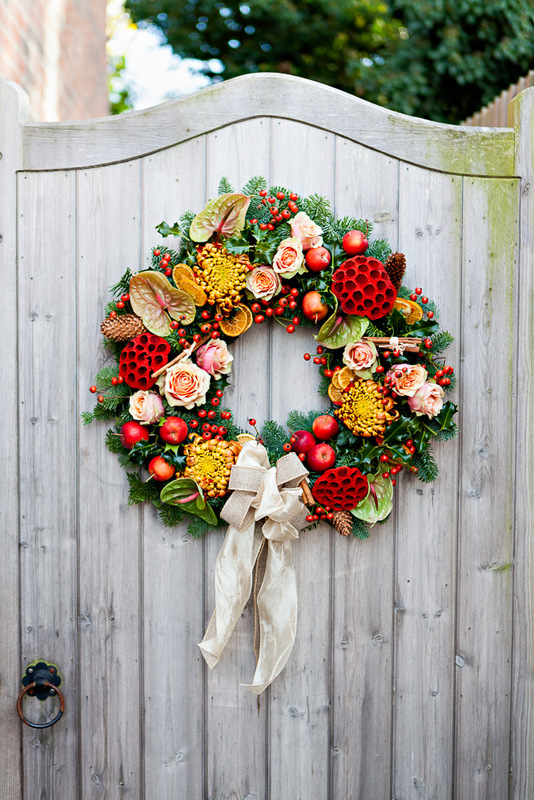 This wreath uses seasonal foliage and fresh fruits, so it smells incredibly festive. And how pretty does it look next to that lovely bicycle?! 1. Before you begin you will need to create a hoop from which to hang your wreath from. 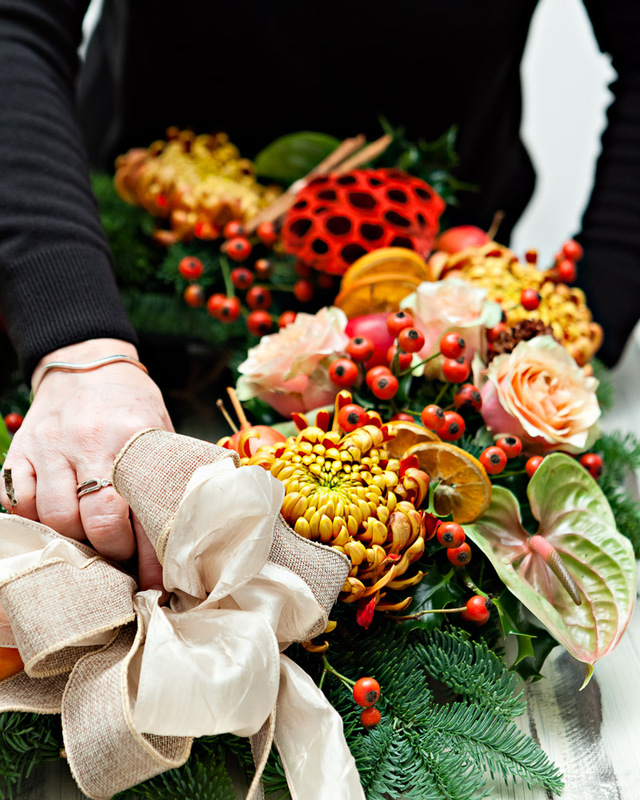 To do this create a loop using florist’s wire or strong twine and attach securely to the back of the foam wreath. TOP TIP: When working on your wreath, remember that this will be the top of the design. 2. Immerse the foam ring in water until completely soaked, then place on a protected work surface, ready to get started. 3. 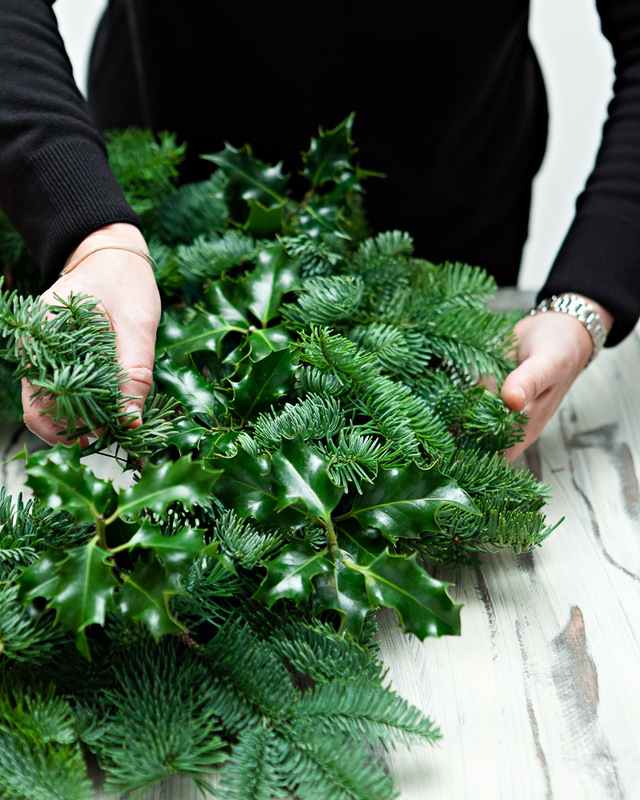 Using a pair of sharp scissors, cut off sprigs of spruce approximately 7 inches in length, then frame the wreath foam with the spruce, inserting each sprig at a slight angle. We recommend removing at least an inch of pine needles at the stem so that you can push the spruce easily into the foam. 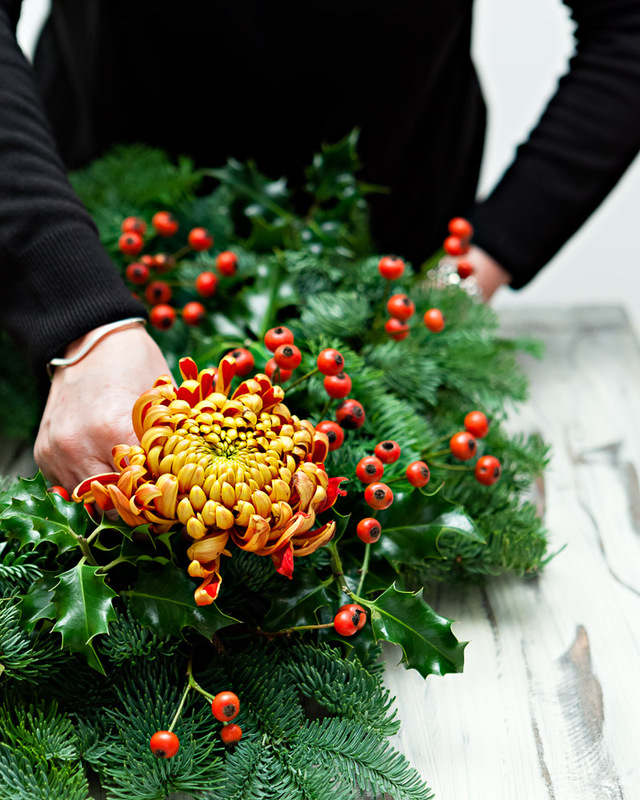 TOP TIP: Work around the wreath in a clock-wise fashion, ensuring each sprig is inserted at the same angle to maintain a circular shape and flow to the design. 4. 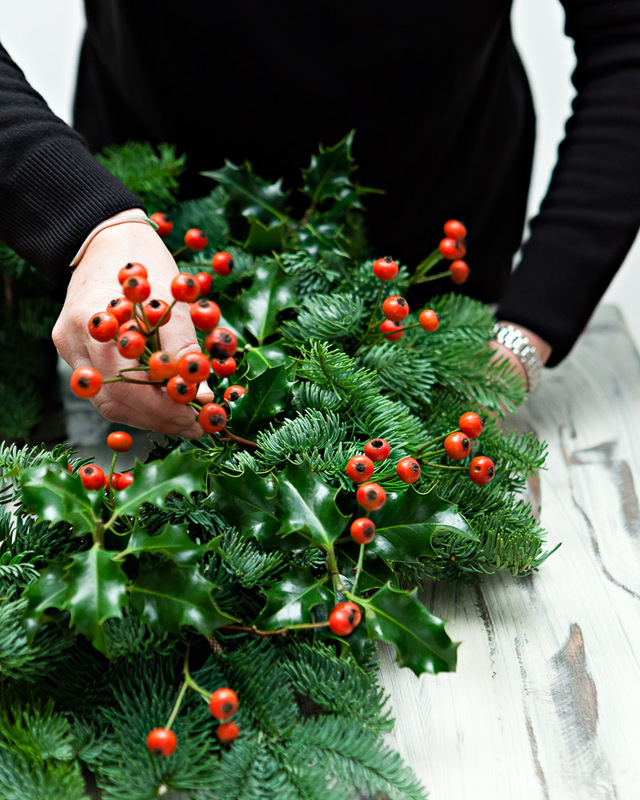 Repeat with the holly and hypericum until the surface of the wreath is well covered and there are no gaps where the foam is visible. 5. 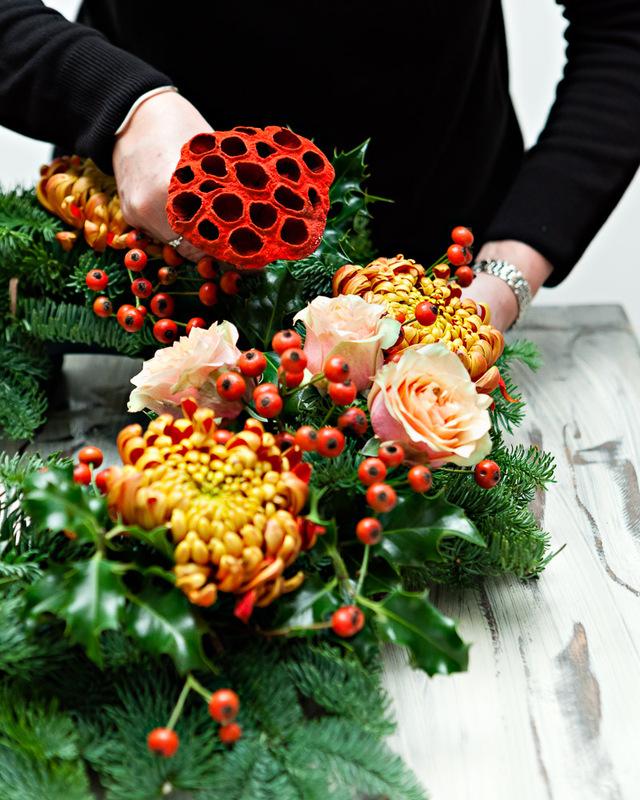 Next, cut the chrysanthemums at an angle and insert into the foam evenly around the wreath. 6. Add the roses and anthuriums in the same way. 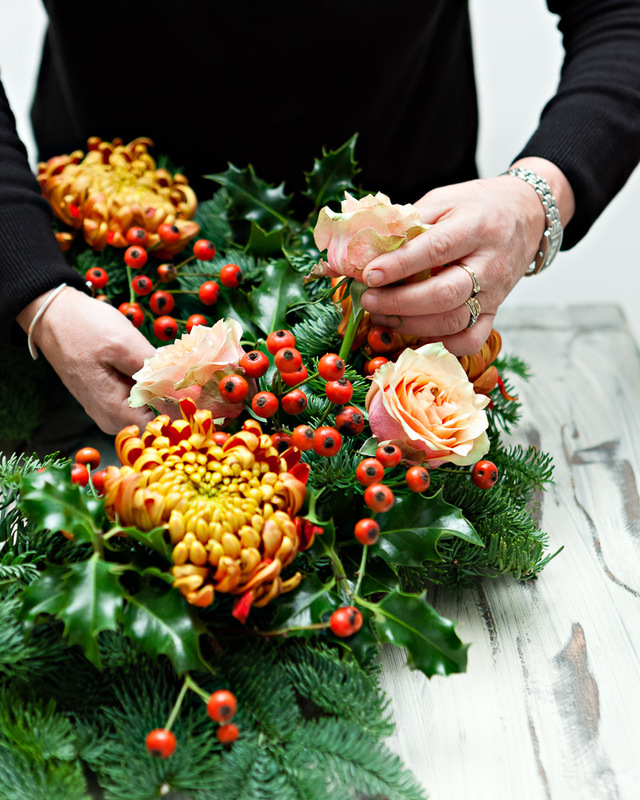 TOP TIP: To reduce the cost of creating the wreath you could substitute the roses for a more affordable flower variety such as the gerbera which also comes in a wide spectrum of colours. 7. 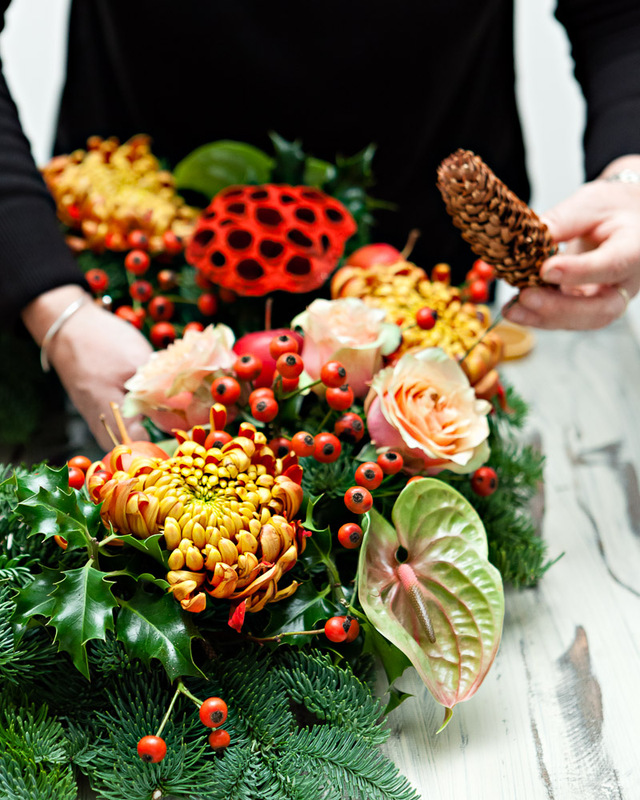 Once you are happy with the positioning of the flowers and foliage add the cinnamon bundles, lotus pods and pine cones, using florist’s wire if necessary to secure everything into place. 8. You can now add the miniature apples. Try grouping clusters of two or three together for visual impact. 9. 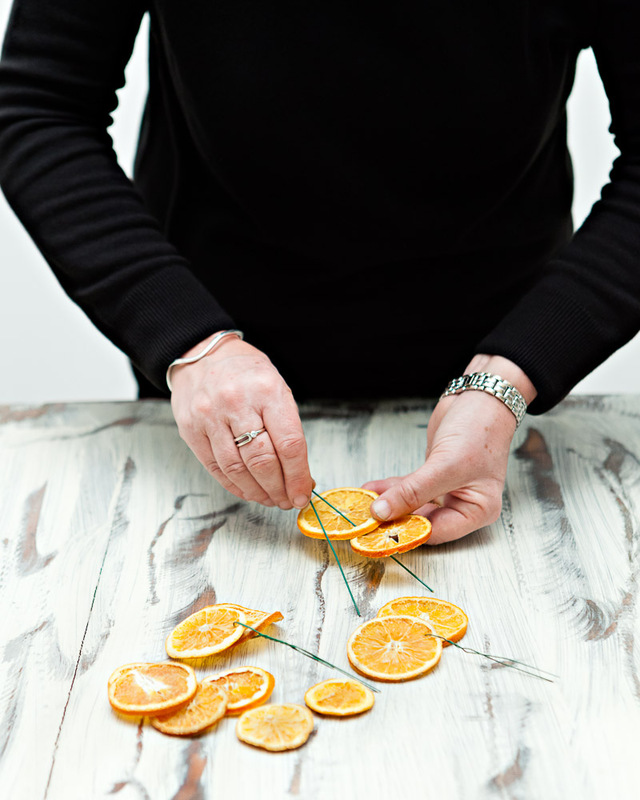 Next add the dried orange slices, this time using florists wire to attach them securely. 10. To complete the look, create a bow using two types of ribbon for added texture and secure into place at the bottom of the wreath using florist’s wire. TOP TIP: Keep your wreath looking fresh by regularly misting it with water. If kept in the right conditions the flowers and foliage should be long lasting, however you can always replace any as they get past their best. Stunning isn’t it?! 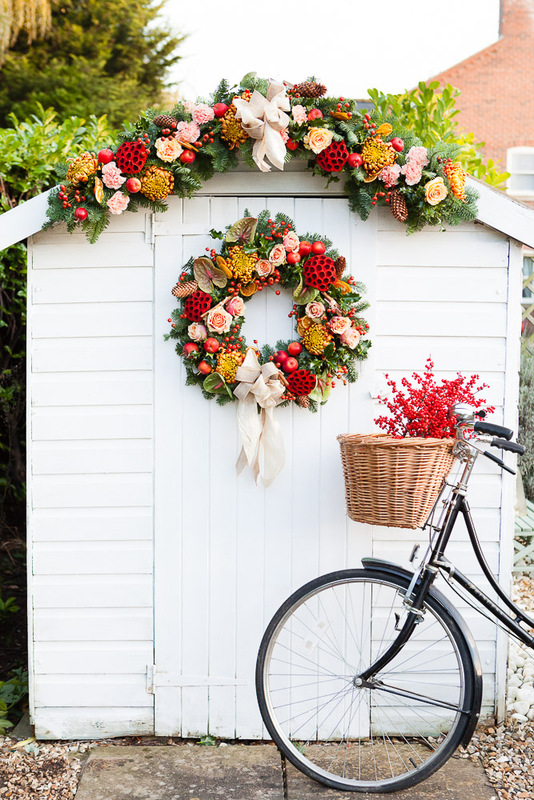 Will you be making a wreath this Christmas? There are some video tutorials provided by Interflora should you need a helping hand. Why not see what trends I’m going with this Christmas in this great blog post from Country Baskets? Disclosure: All images and instructions for this post were kindly provided by Interflora. This is not a sponsored post and I received no payment or compensation for sharing the content. wow this looks great! will be giving it a try!! Would love to see a photo if you do! Happy belated birthday! Hope you had a fab time. Good Morning Claire, I hope you are having a fabulous birthday treat at the Spa…. I can’t think of a nicer way to spend a day. This Christmas wreath is beautiful and I think I shall be making this for Christmas. The step by step instructions were really useful. Pingback: My Blog - Christmas Wreaths!